- Fixed Stuttering when moving if you have a target. - Sopping rotation now also stops auto shoot. - Fixed the moving away from mobs if you don't have aggro (it no longer keeps walking backwards). - Fixed Serpent Sting keep spamming, even when target allrdy has the debuff. - You can now choose mode for cooldown based skills like Rapid Fire, Bestial Wrath etc. Modes available: Cooldown: Keeps it on ccoldown (uses it all the time), Elite: Only uses it on elites (Good for questing), Boss: Only uses it on bosses. - Made a lot of the code smarter. (No more setting an ability to On then reverting back to off, if that ability is not available, now you just can't change it to On. - Fixed Bestial Wrath not working on Cooldown. - Added Volley to the rotation. - Removed some trash code that was no longer being used. - Cleaned up code for faster reaction, and optimized the FPS. - Fixed Cooldowns not being used asap. - Added /wrautomove to disable/enable auto moving from mobs. 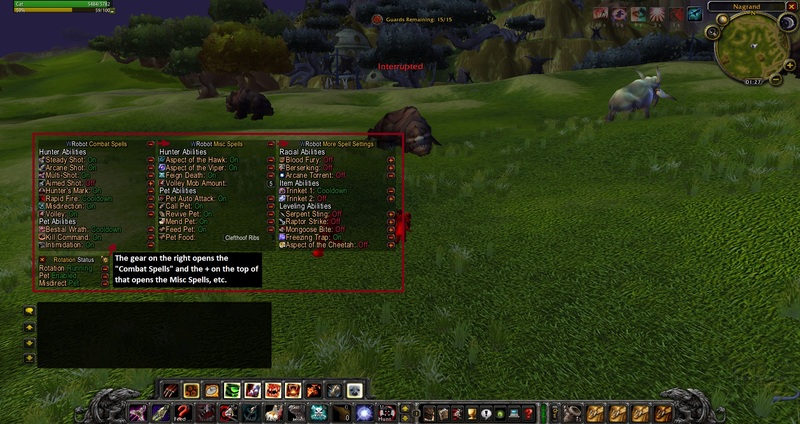 - Fixed the auto move away from mobs, it will no longer keep backtracking, and it will no longer stutter if you are using a questing profile or have character movement management enabled. - Your attack speed is now automaticly calculated, even if you have speed buffs this will change so it fits. (try opening the settings and use Rapid Fire). - Fixed some bugs, that was not fixable in xml here are some of them: The UI does not bug first time you use the fightclass. - You can now ReloadUI even without stopping the bot. - When you pause the rotation in-game WRobot itself will pause; The bot doesn't try to auto-shoot anymore! - The bot will not attack CC'ed mobs. - Volley Mob Amount has been added, where you can change the amount of mobs that needs to be in a cluster for the bot to use volley. - The bot no longer interupts drinking uless you have full mana. - More tight rotation, meaning higher dps and faster use of cooldowns. - Much more has been tightened up. - Removed Ranged Attack Speed from GUI, since this is now automaticly calculated. - Fixed UI messing up if people clicked the fightclass settings before loading the fightclass for the first time. - Changed Aspect of the Viper, it now uses Viper if you have less then 80% mana, and you don't have Hawk on, this is in case you use Aspect of the Cheetah, and don't have enough mana to pop hawk. - A lot of small fixes that did not affect the gameplay. - Rewrote Fightclass AGAIN, now there is no more lag, not even in the in-game menu! Everything is Silky smooth now! (Prettier Interface as well)! - Fixed Bug where bot would walk away from dead targets when trying to loot. - Fixed UI bug, where Aspect of the Viper would Change Aspect of the Hawk. - Another attempt to fix revive on netherwing, if old version didn't work try this. - Arcane shot now requires > 60% mana to be cast. - Serpent sting now requires > 50% mana to be cast. -- This will be changed in the future, because it's not viable for high level playing. - Added better pet control. NOTE: IT'S A NEW FILENAME! DELETE THE OLD ONE! [Q]: WRobot crashes every so often with your fightclass fix? [A]: This is because you have turned logging on. In WRobot click 'Log' then turn off 'Fight'. [Q]: Feed pet doesn't work? [A]: Make sure you press enter after writng food name. Thats about it, not worth the money if you ask me. Why? Dont reenter in combat after faint death. Dosent use pet control on 2 or more target - Major diesadvanges. You will die on two or more agro. This is some amazing work. I'm racing level after level with this fc, and with no problems whatsoever. The menu feature speaks for itself, its genius. This guy makes the best fight classes period.... No questions. Pull out your card and buy it. Then pull something else out and fap cause that's all you can do now because you wont have to babysit his program. I bought this fight class a few days ago and decided to give it a full test drive before posting here. I have to say, this is one of the best fight classes that I have used yet. The options are changed in-game which makes it much easier to adapt to areas and mobs without stopping the bot to change style. I haven't used the auto rotation feature while manually driving the character, but if it works anything like the afk rotation, it should be perfect. **Just wanted to update that I have used the auto rotation feature since I last posted and its phenomenal! Amazing to be able to basically just run the character around and select a target and watch the bot/your group down mobs. It works flawlessly and it's very efficient, no bug outs or weird movements to make my group suspicious. All in all 10/10 from me. This was a great purchase, and I will be making many more hunters because of this. I've been botting private server for quite a while now and used many "fightclasses" over the years and this one BLEW my mind!.... It's so simple great little UI, toggles for the moves u wanna do and the rotation is just simply amazing. Great job Ordush I look forward to more profiles this is definently a 5/5 TOP QUALITY on this forum! One of the best class fight around here (if not the best one lol)..and this guy is always here to assist you with any issues you got!Good job!keep it up!